breakfast was poor; no scrambled eggs; mushrooms cold; no brown bread until I asked ; generally room looked dark room and unappetising . breakfast closed early at 930 on the dot. The interior design was amazing. Staff were very friendly. 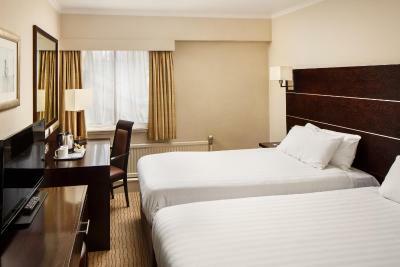 The hotel was a good size and the room wsa generally to a good standard of cleanliness. 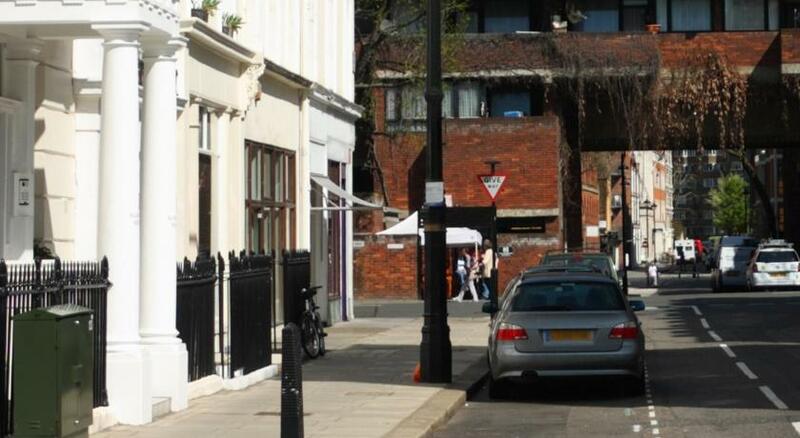 It was in a good location and easy to walk to the places we wanted to get to. bed was comfy the bar staff in the evening were really nice and the was a good choice of drinks. the decor in the lobby was nice location is perfect. 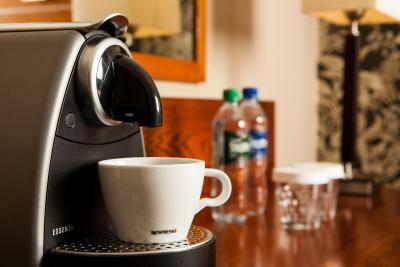 Nespresso machine in room. Good housekeeping services. Breakfast was great. Plenty to choose from and nice and relaxed. Bed was comfortable. 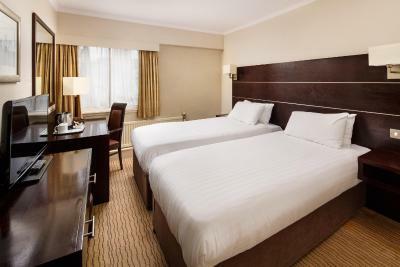 Mercure Leicester The Grand Hotel This rating is a reflection of how the property compares to the industry standard when it comes to price, facilities and services available. It's based on a self-evaluation by the property. Use this rating to help choose your stay! 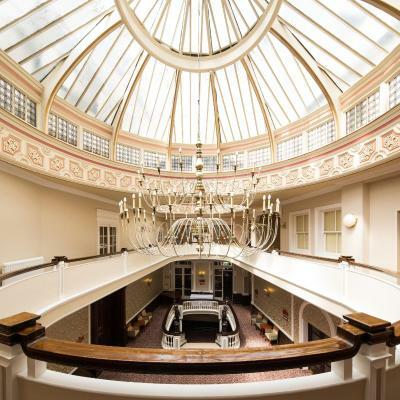 One of our top picks in Leicester.In Leicester city center, this grand Victorian hotel features an elegant restaurant, original features and a 24-hour front desk. 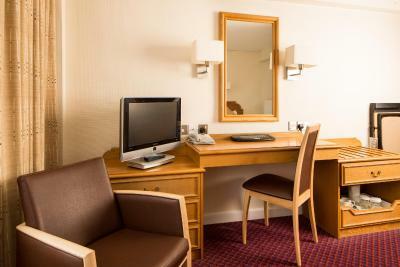 On-site parking is available, and Leicester Rail Station is just 1,000 feet away. 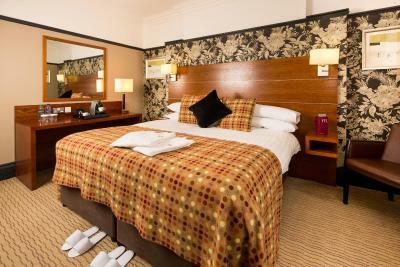 The 4-star rooms at Mercure Leicester The Grand Hotel have a flat-screen TV and free high-speed Wi-Fi. 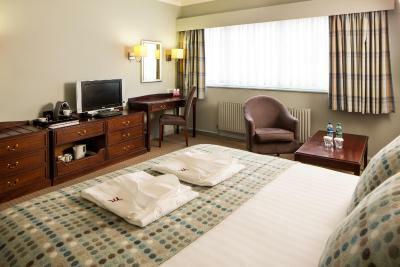 All rooms feature tea/coffee facilities and a luxurious bathroom with free toiletries. 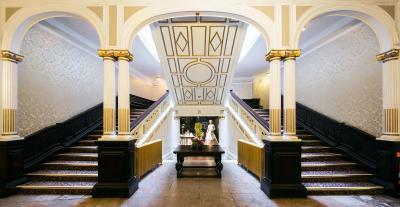 The impressive building has a large Victorian staircase, original chandeliers and an ornate ballroom. 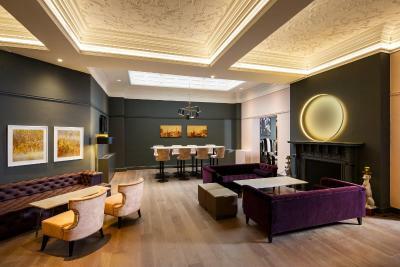 There is also a cozy guest lounge with Roman-style columns and free Wi-Fi access. 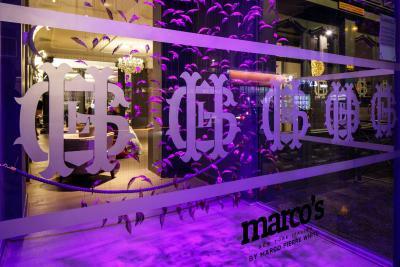 Marco's New York Italian Restaurant serves delicious American-Italian food including pastas, steaks, burgers and handmade pizzas. 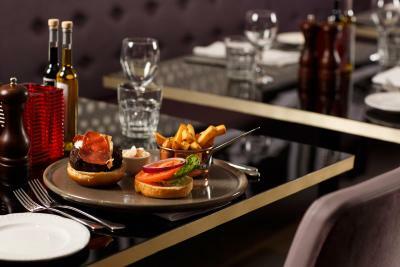 Guests can also enjoy light meals and fresh coffees in the lounge bar. 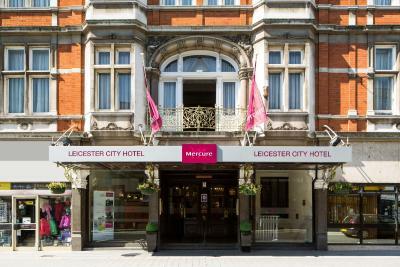 Mercure Leicester is just half a mile from the Highcross Leicester Shopping Center and the famous Asian restaurants of London Road. De Montfort University is only 2,300 feet away. Trendy bars, Asian restaurants and a variety of shops can be found in the Cultural Quarter, which is just a 2-minute walk away. 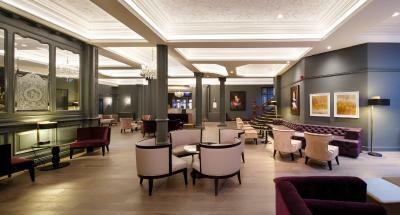 When would you like to stay at Mercure Leicester The Grand Hotel? 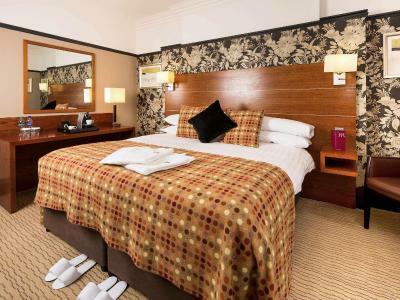 Classic bedroom with 1 double bed, HD LED TV, complimentary high speed WiFi, private bathroom, hairdryer and tea/coffee making facilities. Sleeps 2 adults. 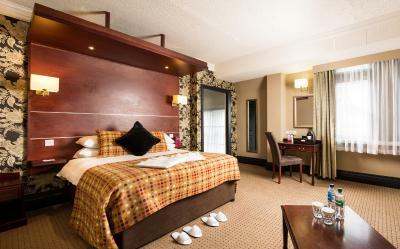 Classic bedroom with 1 single bed, HD LED TV, complimentary high speed WiFi, private bathroom, hairdryer and tea/coffee making facilities. Sleeps 1 adult. 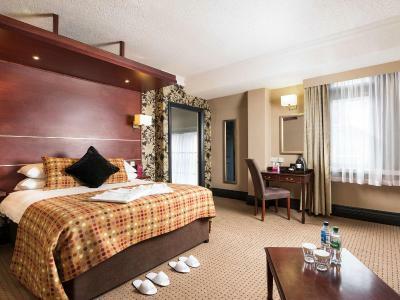 Classic adapted bedroom with 2 single beds, HD LED TV, complimentary high speed WiFi, private bathroom, hairdryer and tea/coffee making facilities. Sleeps 2 adults. Upgraded bedroom with HD LED TV, complimentary high speed WiFi, Nespresso coffee machine, newspaper, bathrobes and slippers. Sleeps 2 adults. This year (2015) we won Leicestershire Tourism's "Large Hotel of the Year" and now we are in the finals of Visit England. Noteworthy history: • Opened in 1898 • Built by Cecil Ogden in 1898 in a grand Franco-German Renaissance style reminiscent of the sixteenth century • Two years later a corner addition was added by Amos Hall. 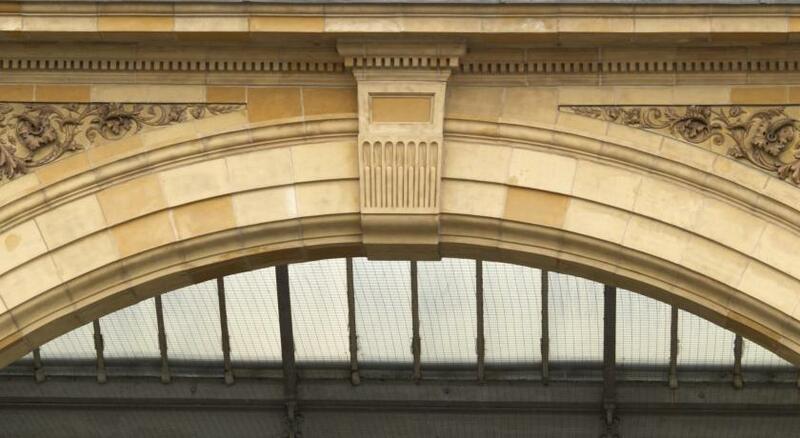 The design was influenced by the churches designed by Sir Christopher Wren. 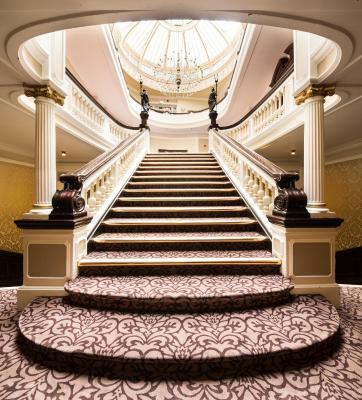 • During the early 1900s part of the Grand, on the first floor, was a cinema called ‘The Kings Hall Cinema’ • The hotel has always been considered one of Leicester's most prestigious. 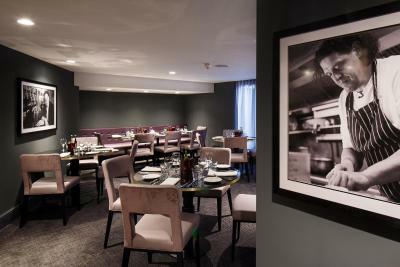 Its heyday was during Victorian times and now returns to these glory days following the recent refurbishments. • Winston Churchill stayed at the hotel in 1909 • The Leicester Caledonian Society’s 75th anniversary in 1952 centered on a splendid Burns dinner at the Grand Hotel, attended by the Lord Lieutenant of Leicestershire, the Lord Mayor of Leicester and Mr R K Sprigg, a grandson of founder member, John Morris Brown. 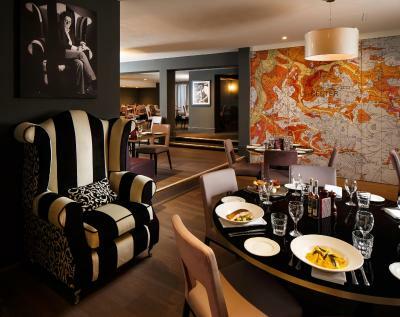 • The hotel escaped bombing during World War II, many employers returned to work there after the war had ended. 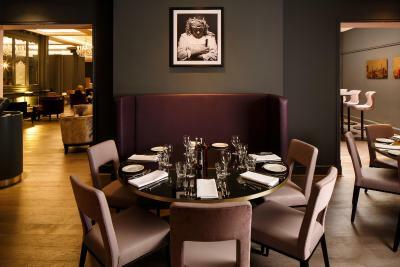 House Rules Mercure Leicester The Grand Hotel takes special requests – add in the next step! 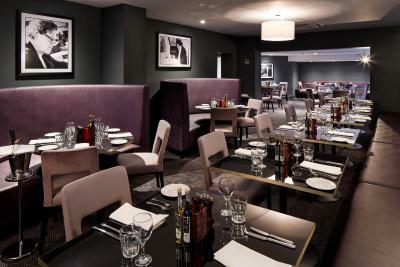 Mercure Leicester The Grand Hotel accepts these cards and reserves the right to temporarily hold an amount prior to arrival. Please note that the property is often host to wedding receptions with nightly entertainment. It is possible that some noise disturbance may be experienced by guests. Temporary roadworks are causing a disturbance to our normal entrance to the car park, kindly note that there is a diversion in place. 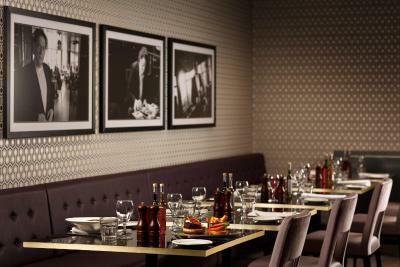 Location was perfect, and the staff were attentive and friendly. There was obviously an investment into the lobby area but the hallways on the floors have loose carpeting and the rooms definitely look old and do not match what you see in the lobby at all. My first room had no cold water for the shower or sink so I had to be moved but even the second room shower did not have a consistent stream of running water and kept giving out bursts of scalding water! The lobby was beautiful, staff was pleasant, the car park was so convenient and very reasonable at £10 per vehicle per night. Also the rooms themselves were very clean. 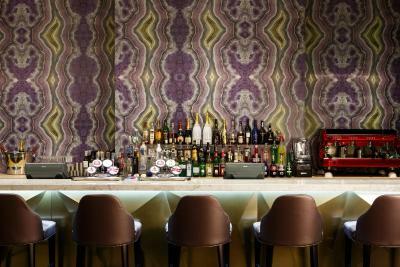 The staff at reception and in the bar were slow and absent from their posts several times which meant a long wait for service. The beds were good but the pillows were hard and poor. The room was cold although the radiator was working but turned very low. There was no hot water in the tap on the wash hand basin. The hot food at breakfast had been standing for a long period and was dried out and tasteless. In general a very poor stay. 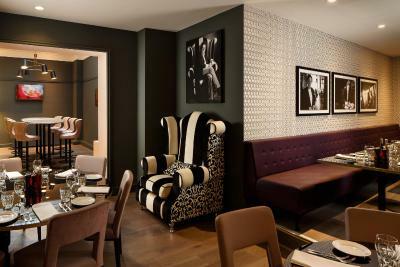 The Hotel had recently been refurbished and although stylish the furniture (seating in public rooms) was not comfortable. 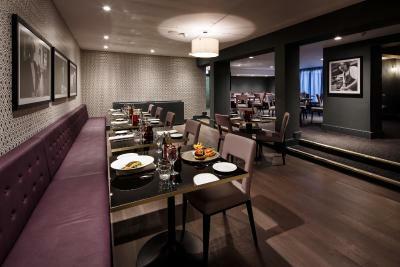 The food in the restaurant was very good in the evening and the breakfast staff very efficient. 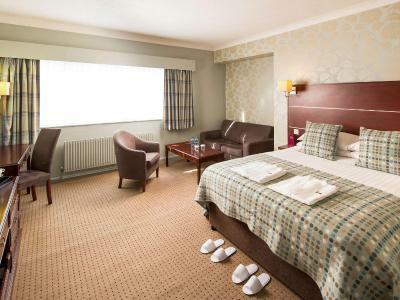 The rooms were very clean and the beds were comfortable. The breakfast was a major disappointment. The cold plate was limited to a selection of mini-croissants (many burnt to the extent of being black! ), mini pain-aux-chocolat and Danish pastries. I was looking forward to a selection of cheeses/salami/hams. The choice of juices was limited to orange or apple juice (no grapefruit or pineapple which was a shame). The hot food which my wife chose was close to being cold. Overall for a hotel of this status I feel this was a really big let down which should be urgently looked at by the management. I hope this negative will however be taken in conjunction with the many positives outlined above - hopefully a balanced opinion which is aimed at being helpful. All the staff I came across were excellent - friendly, attentive and made me feel very welcome. The hotel has a lovely 'faded splendour' feel about it. It's an old Victorian building and therefore has a few creaking floorboards but has clearly been redecorated fairly recently. The bed we had was probably the most comfortable hotel bed I've ever experienced and the room was spotlessly clean. The room was way too hot. The radiators were on full blast and despite turning them off a good 6 hours before turning in for the night I couldn't sleep due to the temperature. The windows were very difficult to open and wouldn't open far enough to cool the room down. 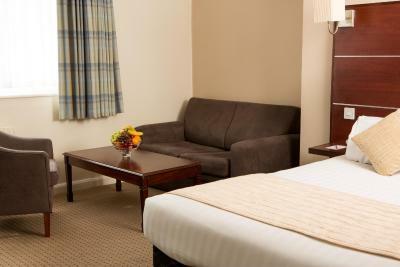 The location is great, the staff were nice (cheking in and out was very quick and easy), and the bed was comfortable. Overall, the room was fine. Made though feel welcome and the staff were very helpful. 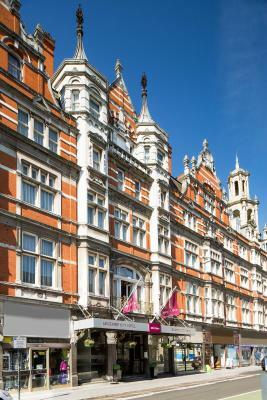 The Hotel is an ideal position for theatre and shopping. The staff are always friendly and helpful and this visit was no exception. However the general state of the 'privilege' room was poor. Only 2 teabags, poor quality and outdated fittings and a dark and dreary decoration with a carpet that had sen better days. I had ordered a bottle of Champagne for our room which was not there until I went to Reception and drew it to their attention. 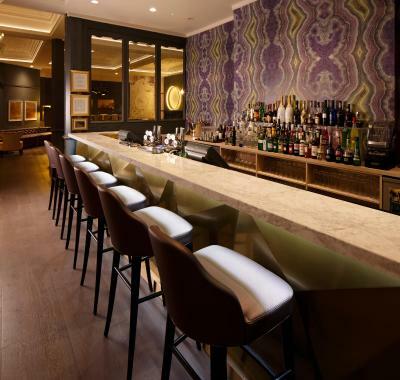 The bar area and foyer were once again good with excellent cocktails again.